Do you guys remember that soap opera Passions? Bear with me for a second here, because this is going to get weird. I swear, I’ll bring it around to a cocktail by the end. In case you don’t remember, it basically involved a bunch of attractive people standing around in a minimal amount of clothing, but it also somehow involved a witch named Tabitha and her dwarf doll Timmy (before he was made into a real boy by “Little Angel Girl”?!). Here’s a classic scene, and go to the Timmy’s Wikipedia page if you want to see how Passions was apparently a soap opera version of Twin Peaks – the whole thing is very weird, and then it gets weirder. In 2002, they killed off the character of Timmy on the show. Incredibly…the GUY WHO PLAYED TIMMY DIED ON THE SAME DAY! My mind is being blown here, and I might need to do a dissertation on this entire phenomenon. It’s fascinating. ANYwho, let’s bring this around to cocktails as I promised. I recently rediscovered my love for Tazo Passion tea and how fantastic in can be in cocktails…hence the musings on dwarves and witches. 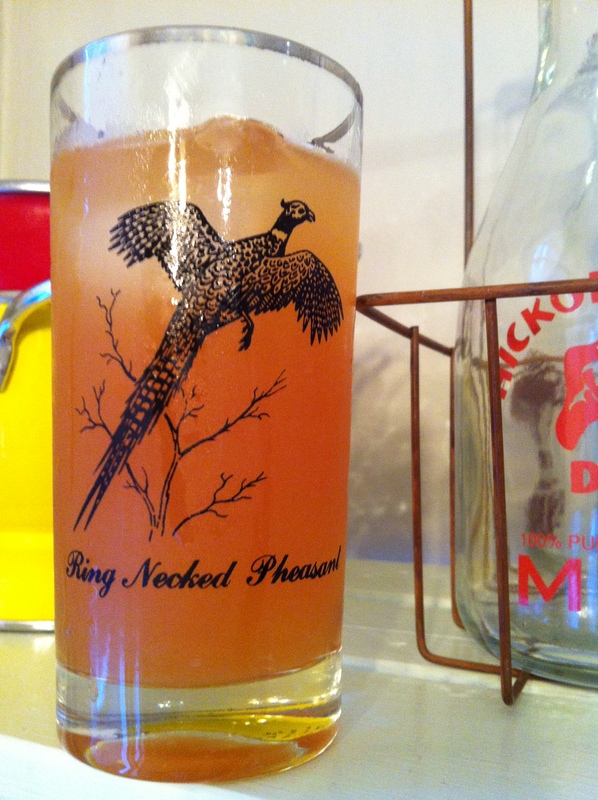 I’m also trying my hand at using wine in cocktails, so it’s getting all kinds of crazy here in this Savannah household. 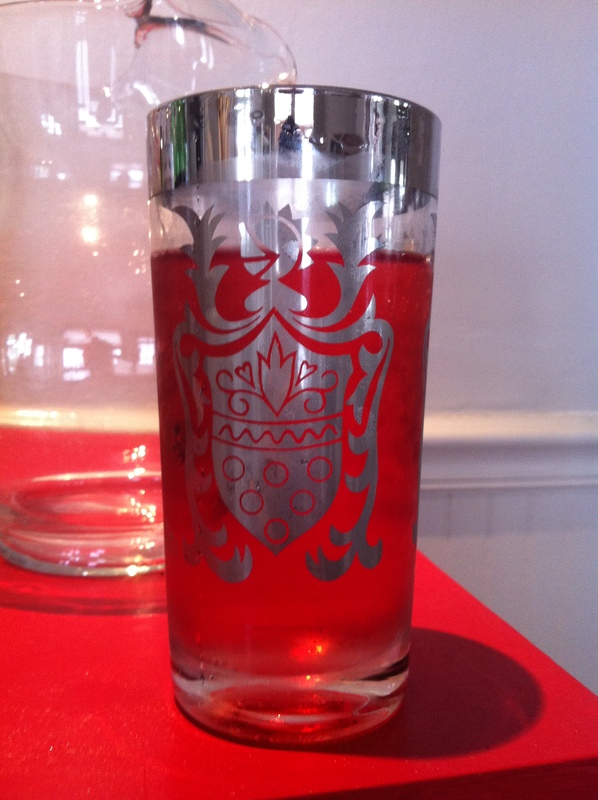 For this particular cocktail – I call it The Timmy Lenox – I used an amazing rosé by Muga. If you haven’t tried it, the price point is pretty great, and it’s totally delicious. Here ya go! It may make you have dreams about witches and dwarves, but I swear it’s worth it. Until next time! I’m not sure if British folks and people from Kentucky (Kentuckians?) get along in the non-cocktail world. My guess is that, given Kentucky’s overwhelming support of Mitt Romney combined with said presidential candidate’s recent kind-of-disastrous trip to the fine city of London might not bode well for this relationship. However! I guarantee that if the Brits and the bourbon makers would just sit down and share one of these delicious concoctions I’m about to share with you fine readers, they would let bygones be bygones and become the best of friends. Even though it still feels like summer down here in Savannah – seriously you guys, it’s going to be a high of 82 on Thursday, and I’m not gonna hide my excitement – I understand that in most other places in the country, autumn is in full force. 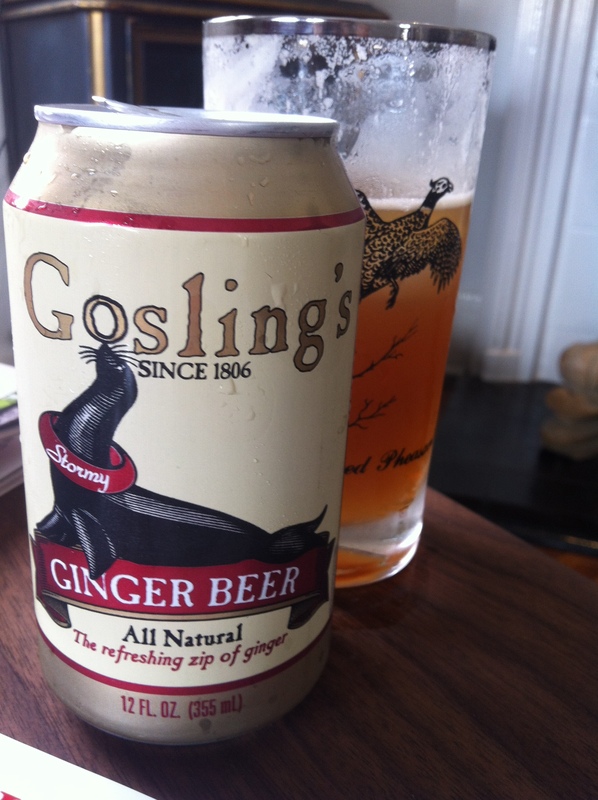 And I think I’ve just come up with the perfect drink for this particular time of year. 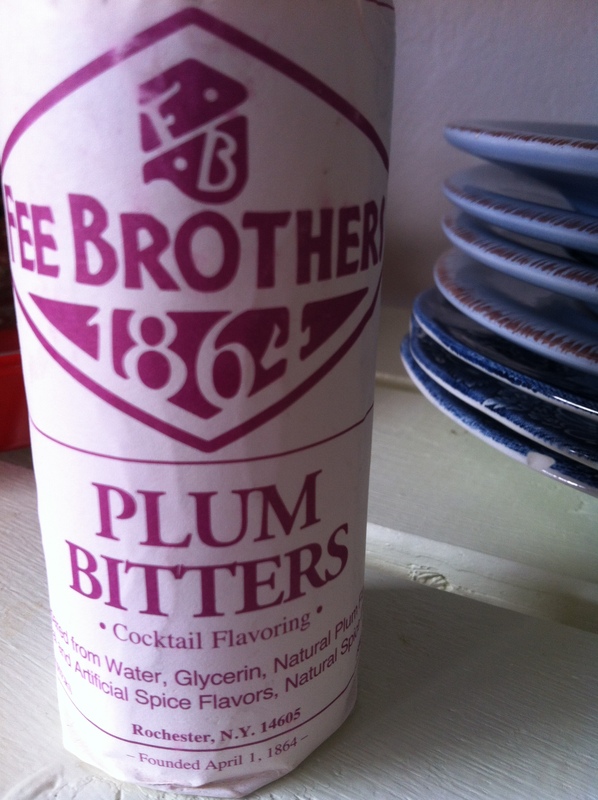 But before we get down to it, I need to take a second to talk about one of my new favorite things in life – plum bitters. I just picked these up yesterday and boy oh boy, am I excited about the possibilities. These bitters are not messing around. Bold and unapologetic, this stuff will knock the socks off of your average cocktail. It’s present, unusual and most importantly, delicious if used in the right context and the right amount. And going with our theme of autumn here, I think they taste as close to a crisp fall day as you can get, this side of apple cider of course. I’m thrilled with the discovery. So here it is, in all it’s autumnal glory, the cocktail in question. I call it, appropriately I think, Fall’s Arrival. Put all of that in your best cocktail shaker and go to town. I’m really proud of this one. It’s complex and interesting. 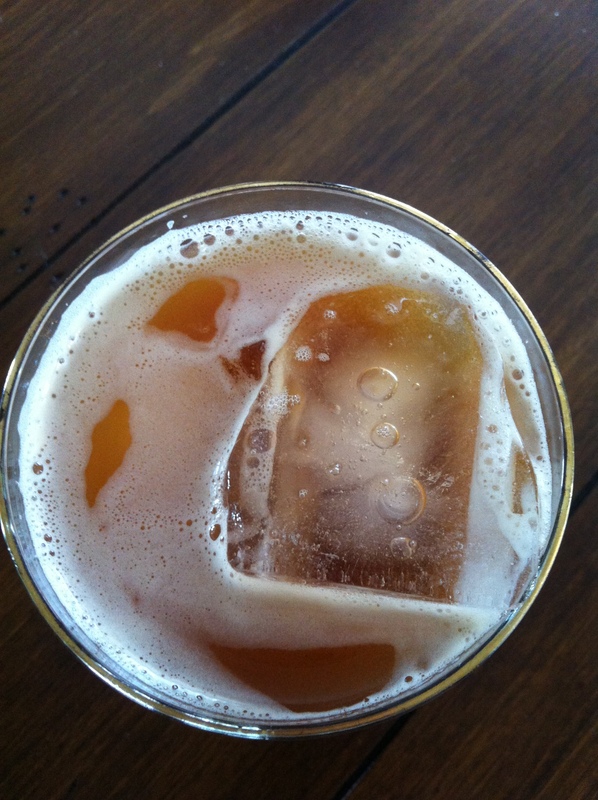 The combo of the subtle spice of the Pimm’s and the boldness of the plum bitters really sing, and the St. Germain adds just the right amount of sweetness. So put on a light jacket, crunch some leaves under your feet, and then come home and make yourself up one of these. It’ll make that perfect fall day that much better. I’m on a prosecco kick these days, so I’m just going to run with it. It’s too delicious not to. Look! 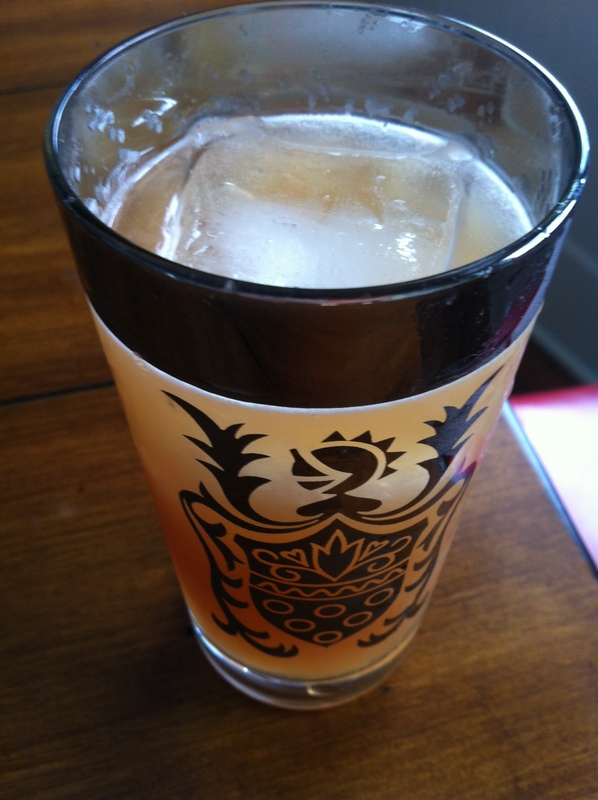 It’s so delicious, the drink is almost gone! Shake all ingredients except for the prosecco, pour into a glass and then stir in the prosecco. It’s pleasing to the palette, I promise. I’m off to Atlanta for a few days, so I’ll likely be away from the blogosphere for a while. I’ll make sure to say hi to Andre 3000 while I’m there though. See ya! I love new discoveries. I recently stumbled across this in my local liquor store. It’s called Esprit de June. 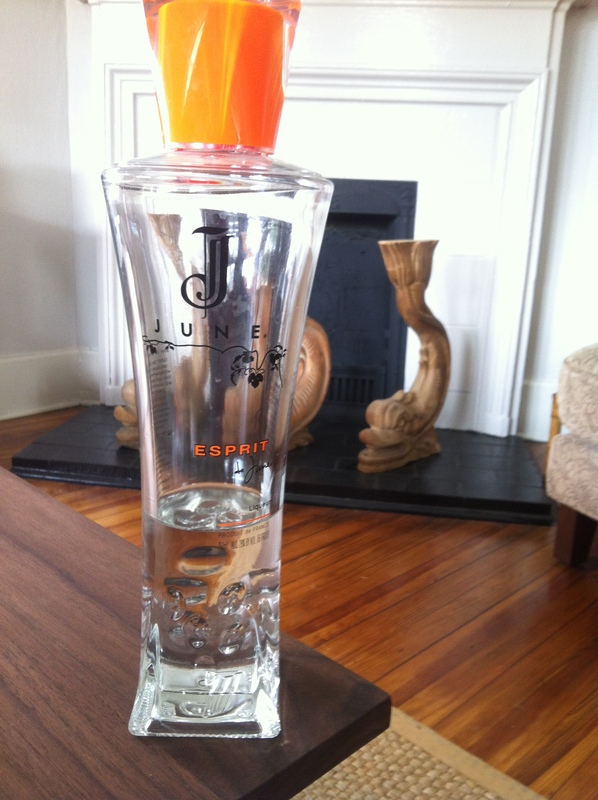 Full disclosure…I definitely bought it because the bottle is really cool. I’m a slave to marketing, and I fully accept that. But! It also happens to be delicious. According to the bottle, “Esprit de June is a rare liqueur crafted with ephemeral flowers from ugni-blanc, merlot and cabernet-sauvignon grape varietals.” While that may sound entirely bourgeoisie, I’m willing to accept the haughty nature of that description because it’s a very lovely, kind of exquisite liqueur. 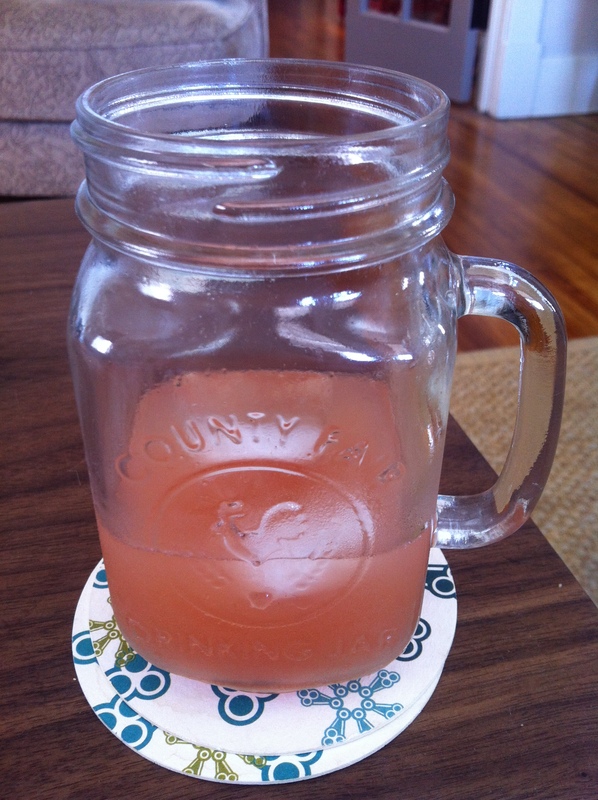 It reminds me a little bit of St. Germain, but it’s a little more subtle and not as sweet. And somehow it manages to be delicate while still being very present in a cocktail. I’m a really big fan, and not just because it reminds me of ladies from the 80s. As soon as I tried Esprit de June, I knew it would pair extremely well with sparkling wine. And lo and behold, it does! If you’re looking to impress your friends and spice up your brunch cocktails, this will definitely do the trick. Honestly, I could probably put together five different champagne cocktails with just this and things I have hanging around the house. But here’s one that I thought was particularly delicious. It’s guaranteed to make that brunch you’re hosting at your humble abode that much more fancy. And who doesn’t want a little more fancy?! 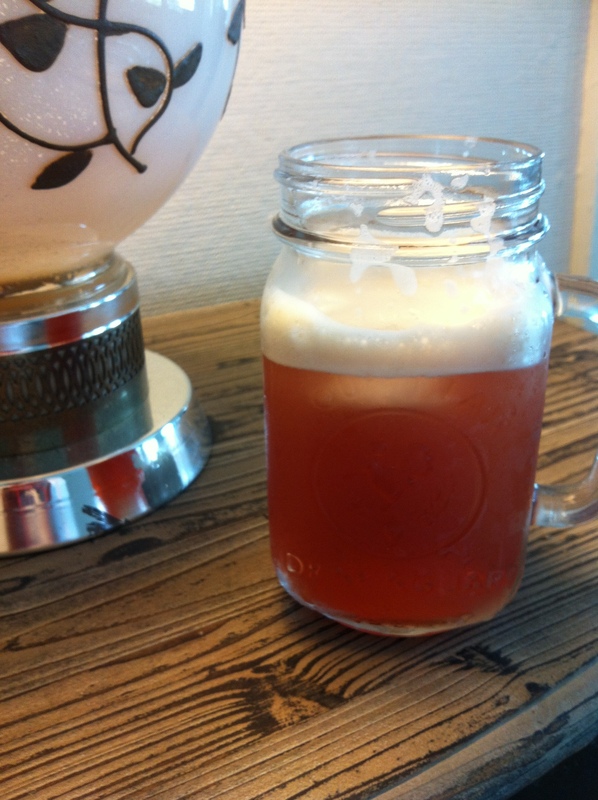 Put everything except the beer and seltzer in a cocktail shaker, shake it up, pour it into a highball glass and then add the beer and seltzer. It’s kind of a smoky, bacony, mapley delight. And just a note on rye here. I tend to prefer rye that’s not entirely traditional. I find many ryes to be a little too harsh (Bulleit Rye comes to mind). But I know that’s just me, so if you’re a big fan of traditional ryes in all their robust glory, feel free to tell me to shut the hell up and use one of those instead. I’m merely here to guide and mildly entertain. Until next time. For all 7-10 of you who read this…I’m back! Sorry for the extended hiatus – I was in New York for the premiere of the PBS documentary project I just finished working on – Half the Sky, check it out! – so the blog took a bit of a backseat. But now that I’m back in the world of porch swings and unemployment – phew! – I’m back at it. 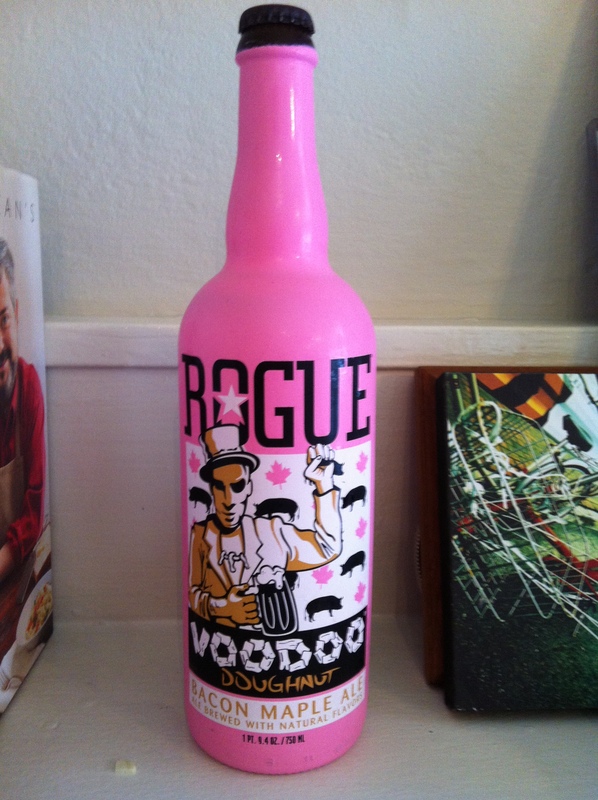 That’s right – Bacon Maple Ale, brought to you by your friends at the Rogue Brewery AND Voodoo Doughnut, two longstanding residents of that lovely town of Portland, OR. For those of you who don’t know, Voodoo is a fantastic doughnut shop franchise in Portland, famous for its maple bacon doughnut above all. Amazing. I saw this in my local gas station market – surprisingly good beer selection there…who knew?! – and my curiosity (and weakness for manipulative marketing AND love of bacon) got the best of me. I had to try it. I mean, look at that bottle! The result is…well…I’m still trying to figure it out. My first taste was pretty shocking and unpleasant. It’s extremely smoky and yet sweet at the same time (not surprising, I suppose) and I can’t imagine drinking an entire bottle of it. I almost gave up on it since my first reaction was so visceral, but my perseverance won the day and I went back in for more. And you know, it’s not half bad. It’s strange, interesting and certainly adventurous. And it smells wonderful. Ultimately, I don’t think it’s a success, but I commend the folks at both institutions for trying something pretty ballsy. And what the hell – I’m going to try to make a cocktail out of it before the bottle is done. It could be an utter disaster, but I enter into the adventure with reckless abandon, in the hopes that deliciousness will be had. I’ll report back soon!